↑ "Circle Style Kabaddi in a new avatar - World-wide Kabaddi League". ↑ "Kabaddi player alleges Punjab Police pushed him into drugs". ↑ "Punjab women enter semifinals of National Hockey Championship". ↑ "World Kabaddi League announces team franchise names and logos". ↑ "the World Kabaddi League (WKL) was launched with the promoters — Punjab Deputy Chief Minister Sukhbir Singh Badal is the president of the league while former India hockey captain Pargat Singh is the league commissioner — unveiling the eight teams, their owners and marquee players". 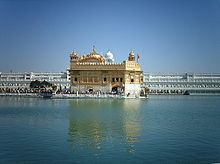 ↑ "World Heritage Day: 8 places to visit in Punjab". ↑ Punjab. Mapsofindia.com. Retrieved on 2012-01-18. ↑ "Pictures displayed at media centre attract visitors to 'Kila Raipur' games". ↑ "Kila Raipur sports festival begins today". ↑ "Kila Raipur sports festival concludes".